Capri is an island of limestone rock that represents the outermost tip of the mountain chain on the Sorrentine peninsula. The coastline, whose dolomite cliffs fall right to the sea in many spots, is dotted with countless caves and surrounded by reefs whose shapes suggest fantastic creations. Capri and counsealor to the Angevin Queen of Naples Joanna. You will find many luxury hotels accommodation and a very interesting nightlife with nice bars and clubs. Mount Tiberio (334 m.), to the east, and Mount Solaro (589 m.) to the west are the two main peaks on the island of Capri. 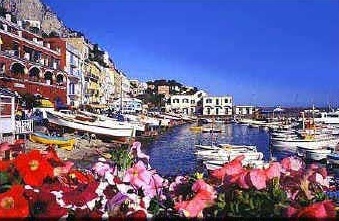 Between these heights, on a saddle-shaped ridge connecting the Marina Grande, ("Large Marina") - north end - and the Marina Piccola, ("Small Marina") to the south - is the town of Capri (138 m.). The other town, Anacapri (286 m.), sits in the large, verdant plain to the west of Mount Solaro. Capri contains a vast variety of plants and flowers, offering no fewer than 850 species and 130 varieties, despite its extremely small surface area, including some rarities, such as the dwarf palm, which has survived in a number of inaccessible areas. In terms of wildlife, many species of marine animals enrich the surrounding sea. On land, there are many types of non-migratory birds, such as the large diomedei gulls, and there are also reptiles, whose number includes the very rare lizard of the Faraglioni rocks. The etymology of the name Capri must be traced back to the Greeks, the first colonists to populate the island in recorded time. This means that "Capri" was not derived from the Latin "Capreae" (goats), but rather the Greek "Kapros" (wild boar). The numerous fossil remains of that animal found on Capri confirm that it was once the Island of the Wild Boars, and not the island of the Goats, as the Latin derivation would seem to indicate. Inhabited since the palaeolithic age, when it was still attached to the mainland, the island later became Greek, and then Roman. After visiting Capri in 29 BC, Caesar Augustus was so taken with the island's beauty that he bought it from the city of Naples, giving up the nearby island of Ischia - much larger and Licher - in return. Legend has it that his successor, Tiberius, who lived there from 27 to 37 AD, built twelve villas, dedicating them to the twelve gods of Olympus. From the most magnificent of these dwellings, the "Villa Jovis", he ruled the Roman Empire. Other emperors spent time in Capri, which was visited and inhabited by Roman nobles up through the IVth century AD. Returned to the ownership of the Dutchy of Naples, the island was raided by the Saracens in the sixth and seventh centuries, and was dominated during various periods in the years that followed by the Longobards, the Normans, the Angevins, the Aragonese and, finally, the Spanish. The island experienced a period of renewed good fortune in the 17th and 18th centuries, in coincidence with the great political and artistic upsurge of Naples, and thanks to the existence of an active church diocese, as well as the privileges granted the island, first by the Spanish and then by the Bourbons. Evidence of this golden period is the stupendous architecture of the churches and convents built in the two towns. Beginning in the second half of the 18th century, the island became a preferred destination of the Bourbons, who went there to hunt quail or simply to travel. Many of the increasing number of visitors from the north who came to take in the magnificently primitive nature of the south included the island in their travel plans and gave the world its first images of Capri. Unfortunately, their arrival also brought about the systematic plundering of the extensive Roman ruins, preserved almost intact through the centuries. As a result, a tremendously rich heritage was devastated and dispersed, so that today only a few traces remain. These are found primarily in the digs that are resumed at periodic intervals. Starting in the first half of 19th century, in the wake of the discovery of The Blue Grotto, or "Blue Cave", the flow of Italian and foreign tourists began, being drawn to the island by the climate, the hospitality of the people and the colours and magnetic atmosphere of the various sites. Writers, painters, exiles, rich and eccentric visitors: from the end of the 1800's until the Second World War, many chose the island as their year-round or seasonal residence, building villas and contributing to the creation of the multi-facetted, multi-lingual, cosmopolitan colony that made the name Capri famous and established the island's myth. The Chartreuse of Saint Jacob, simply called "La Certosa" (Chartreuse), is the most representative example of Capri architecture. It is an ancient monastery, which now includes a museum, a school and a library. It's open to the public, together with the adjacent little garden. The Chartusian monastery was founded between 1363 and 1375 by will of Count Giacomo Arcucci, gentleman of Capri and counsellor to the Angevin Queen of Naples Joanna I: the reason for this will was a votive offering to get a male child and heir. Chartusian monks, well-liked by the Angevins first and Aragon kings later, expanded and increased their properties and wealth, having a great influence upon the island life. With the arrival of Spaniards, the island went through a decadence period and the monastery was no exception. The well-defended position didn't succeed to escape the raids by Saracens: Most disastrous of all were the fire and the pillage done by pirate Dragut and Mustafà Pascià, after which the monks were obliged to make large repairs and to build a new defense tower. In Napoleon Era, in 1808, following abolition of monastic orders, the monastery was closed and the monks dispersed. For about a century it was forsaken, sometimes used to minimal functions (storage, jail) which had bad influence upon the state of the building. In 1920, following a new interest sprung up among artists and highbrows for island of Capri, the monastery received several historical restorations by Chierici. More damage was done during Second World War and first post-war years. In the fifties and sixties, as a result of a major building city development, the Chartreuse lost its lonely and outstanding position in the middle of the plain where it was built on. Today, after some more restorations, into the La Certosa are placed: a secondary school (about Classical studies), the municipal library and a museum with paintings and archaeological findings, and also a space for travelling exposures. Recently the little garden and belvedere behind the monastery were opened. According to the Roman writer Tacitus, at Tragara was built one of 12 Roman imperial villas in Capri, connected to the landing point of Tragara's port lying below, in the small sheltered cove behind the Faraglioni. For its panoramic and climatic position it was probably enjoyed as a winter residence. During the hot seasons the Romans lived in villas to the north, exposed to the fresh summer breeze. In 1875 some ruins of this villa were still visible, as related by Spanish diplomat E.Castelàr in memoirs of his journeys. Today nothing remains of this magnificent villa, except for a marble roofing now situated into the Rosary chapel at St. Stephen's church, aside the Piazzetta (Capri's main square). I Faraglioni, these timeless rock formations jutting from the sea, are certainly the best renowned Capri's feature in the world. They are three (to tell the truth there's another one further apart): the first one, joined to the coast, is called 'Stella' (Star) or also 'F. di terra' (F. on earth) and it is 109 meters high. The second and smallest one is called simply 'F. di mezzo' (Middle F.) and it's 81 meters high. The last one on the outside is named 'Scopolo' but is also called 'F. di fuori' (Outward F.) and it is 104 meters. They are famousbesides other things, for hosting a rare variety of lizard, the so-called 'Blue lizard' (lacerta coerulea muralis or faraglionensis) that had generated a peculiar bluish colour all over its body. Once they thought it lived exclusively on Capri's Faraglioni, but it seems to be present also on other similar rocks along Sicily coast. Villa Jovis. In Capri there are some ruins which belong to the Roman Age, when Capri was chosen as residence by two emperors: Octavian Augustus and his successor Tiberius. Especially the latter built some charming villas on the top of the hills in Capri. By tradition, there would have been no less than twelve wonderful villas all around the island, each of them dedicated to one of the Olympus gods. Unfortunately they remain only few ruins about three of them that you can visit: Villa Jovis, Sea Palace and Damecuta. Other ruins were absorbed into most recent villas or taken to palaces and museums abroad.